This event features a variety of locally crafted beers and chili cook-off teams all vying to be named the crowd favorite. 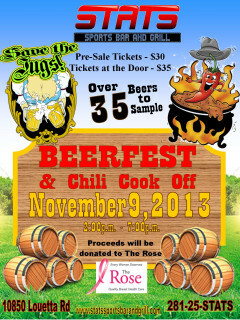 Trophies will be awarded for favorite chili, hottest chili and best decorated booth. Visitors to the Beer Fest will sample more than 35 craft and import beers from 10 different breweries. Festival goers will receive a souvenir beer mug along with a beer passport and pen to keep track of the ales they've tried. There will also be experts for the visitors to chat with about these unique beers and how they are brewed. If you would like to compete in the cook off, email statssportsbarandgrill@yahoo.com or call 281-257-8287 for information on how to enter. $30 in advance; $35 at the door; $50 donation to compete in the cook off.